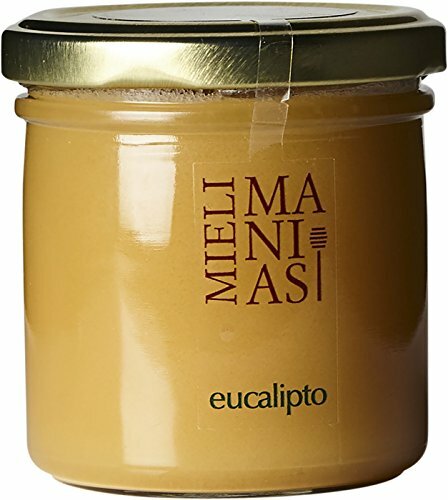 Luigi Manias's raw eucalyptus honey evokes the woody aroma of the Mount Arci Natural Preserve's eucalyptus plant, found in Sardegna. Like all honey, it has both homeopathic and culinary uses. It is considered a treatment for coughs and sore throats, and is the world's oldest sweetener. Miele di eucalipto is considered especially healing since the compound eucalyptol is a natural anti-inflammatory and decongestant. But health chatter aside, we really love Luigi's Eucalyptus honey for its quirky, herbal flavor and smooth sweetness. Stir it into warming tea or hot chocolate in the winter, drizzle it on fresh summer fruits, or pair it with your favorite fresh or aged cheese. We love to mix Luigi's Eucalyptus honey with some top-quality Gustiamo olive oil and Sirk grape vinegar for a salad dressing that will never fail to draw compliments! Its rich vegetation and lack of pollution make Sardegna the perfect honey-producing region - it is believed that beekeeping has been a tradition on the island since at least the 17th century. Luigi himself is a third generation beekeeper; his family has the longest documented beekeeping activity in Sardegna, and he is considered the leading Italian authority on the subject. Luigi has won more national awards for his honey than any other Sardinian beekeeper, and he frequently holds lectures and workshops in apiculture. Luigi is also a passionate believer in sustainable agriculture; in 2009 he moved his honey production to the Mount Arci Natural Preserve, where his bees enjoy a pristine environment and incredible plant diversity. His honey lab is built entirely of mud bricks, following the most stringent criteria of eco design. He produces five varieties of organic honey: Millefiori (thousand flowers); Eucalyptus; Cardoon; Asphodel and Corbezzolo. If you have any questions about this product by Liccu Manias, contact us by completing and submitting the form below. If you are looking for a specif part number, please include it with your message.